Intercepter-NG is a program for performing man-in-the-middle attacks. 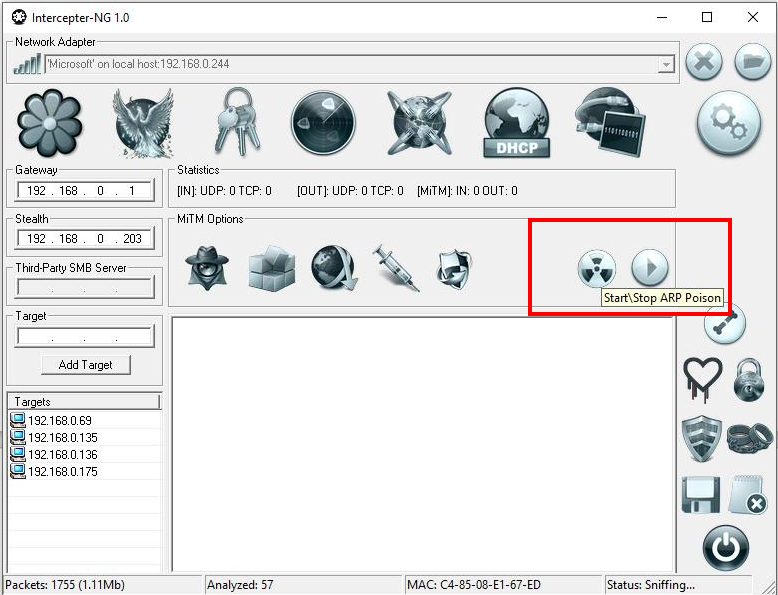 There is a large number of programs for such attacks, the main feature that distinguishes Intercepter-NG among the others is that the program was originally written for Windows platforms and works fine in this operating system. 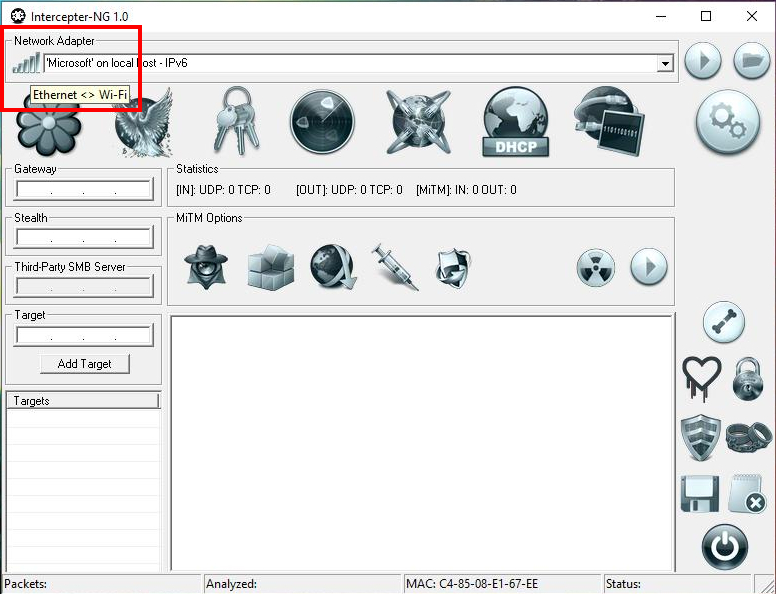 In addition, the program features a graphical interface, which contains numerous functions and options related to the man-in-the-middle attack, as well as some other tasks of pentesting. 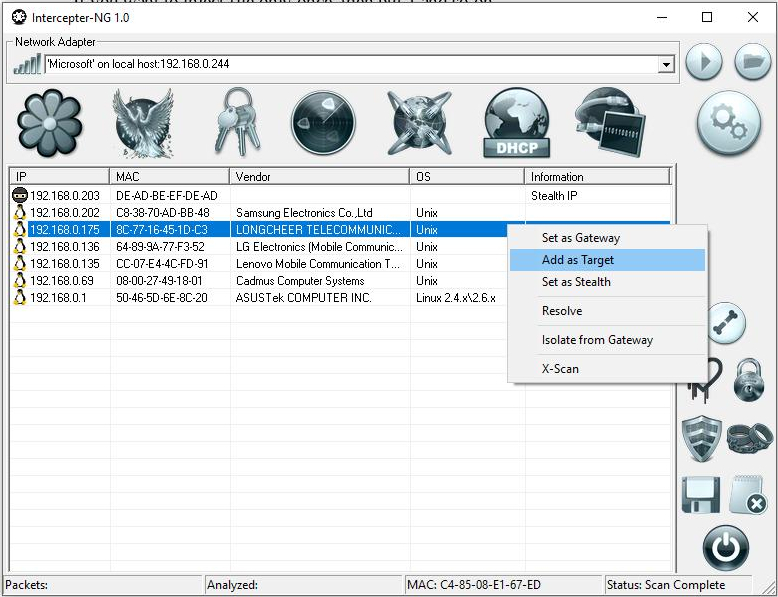 Thanks to the graphical interface, it is easy to use Intercepter-NG. However, a large number of options and fragmented documentation can confuse a novice user. This manual is written for beginners, perhaps even without the experience of working with similar utilities in Linux. The main task of Intercepter-NG is to perform a man-in-the-middle attack. In a practical sense, the man-in-the-middle attack (it is also called the mediator’s attack) consists in the ability to view the data transmitted by other users on the local network. Among these data can be logins and passwords from web sites. 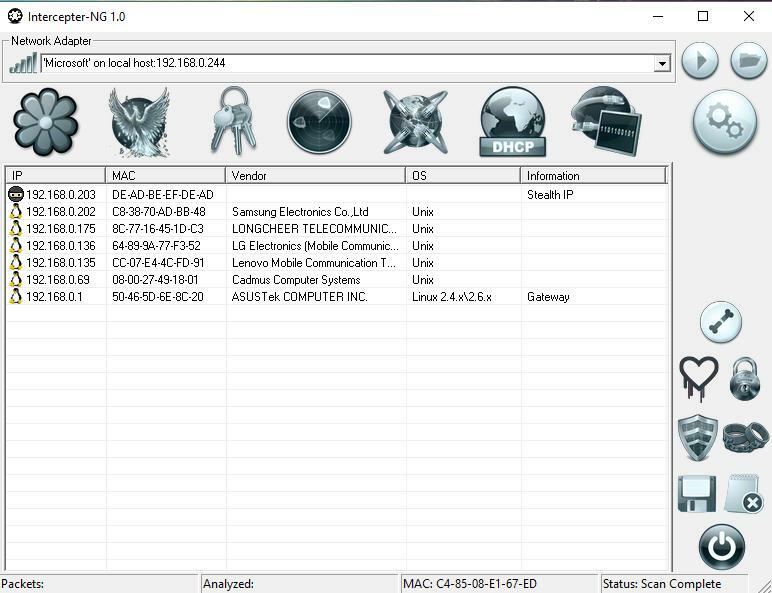 The transmitted data can be analyzed and saved, and also modified on the fly. To describe the technical essence of this attack, imagine a local network. Such a local network can be several computers in your apartment that are connected to a router. It does not matter whether they are connected by wire or by Wi-Fi. The router receives requests from computers, redirects them, for example, to the Internet, and the received answers are returned back to the computers that sent the requests. In this situation, the router is the gateway. 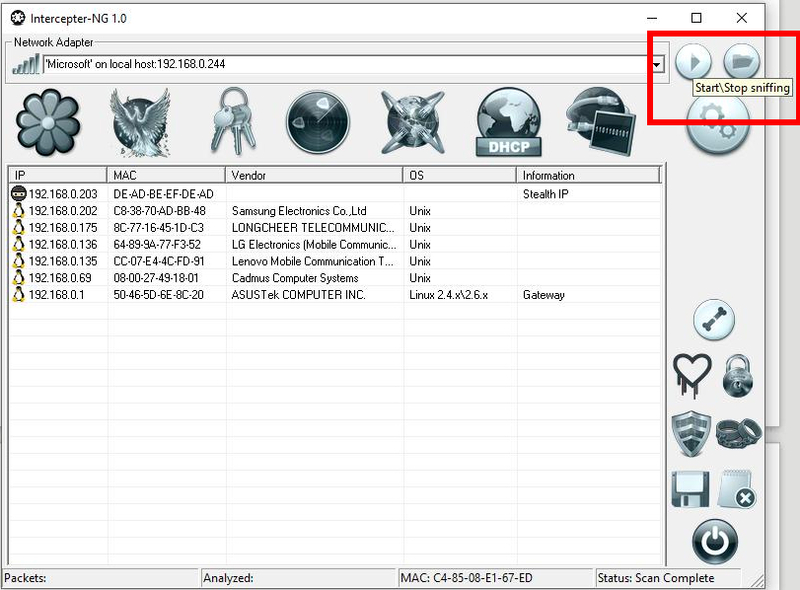 Due to the attack, called ARP spoofing, the computer starts to consider the gateway not the router, but the attacker’s computer. The attacker receives requests from the ‘victim’ and sends them to the destination (for example, requests the contents of the website on the Internet), receiving a response from the destination, he sends it to the ‘victim’. In this situation, the attacker becomes an intermediary. Intercepter-NG implements the ARP attack and performs it automatically. 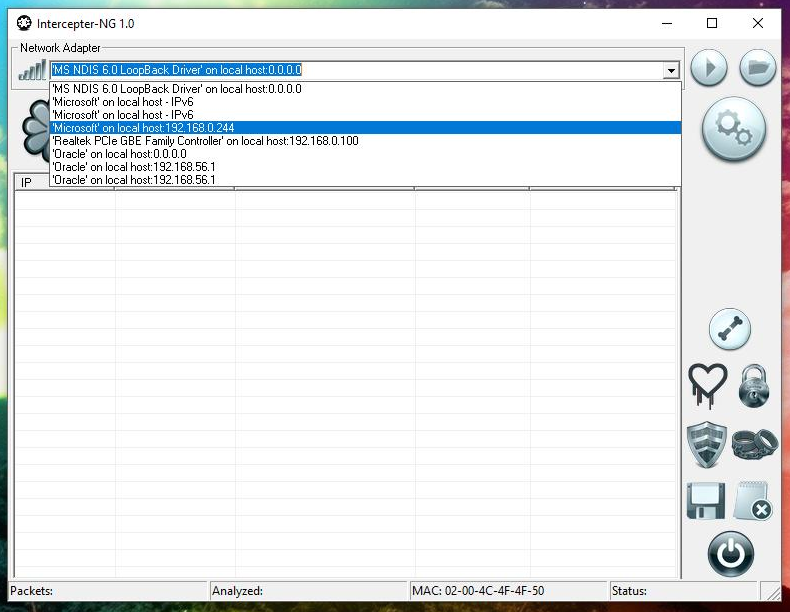 All this works fine only for unencrypted data. If the data is encrypted (HTTPS), then they can not be analyzed without additional actions. Before connecting to the website, computers query a DNS server (name server) to find out an IP address of the requested host. Intercepter-NG is able to change DNS replies (DNS spoofing), which allows you to redirect a ‘victim’ to fake clones of web sites for subsequent attacks. This is not all the features of the program. We will get acquainted with other possibilities later in this manual. The downloaded program does not need to be installed - just unpack the archive. Let us start with a normal man-in-the-middle attack. see which sites the user visits and what files they download. 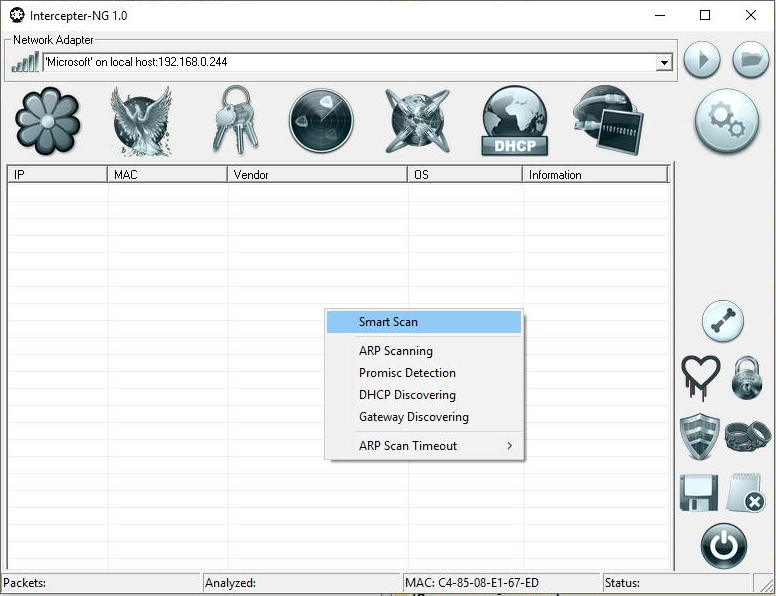 A basic attack involves scanning the local network, selecting targets, launching sniffing, and starting ARP spoofing. With these actions, a number of other, more complex attacks begin. Click on the record with the right mouse button and select Open in browser - the page visited by the user will open, and you will be logged in under the user who owns the cookie. Cookies can be updated over time, and we will not be able to login with the old cookies on the site. Therefore, we would like to receive a username and password. But while the cookies are working, the user does not need to enter credentials every time, so although the ‘victim’ are using a web site, we cannot intercept his credentials. In order not to wait until the cookie expires and ones need to enter credentials, we can speed up this process - zeroing out the cookies. For this there is a special option: Cookie Killer. Cookie Killer clears cookies, thereby forcing the user to reauthorize - enter a username and password so that the attacker can intercept them. 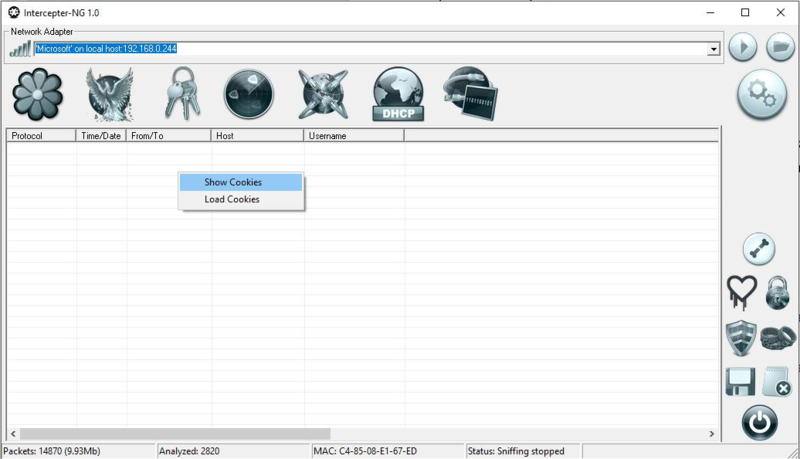 The Cookie Killer function also works for SSL connections. There are black (misc\ssl_bl.txt) and whitelists (misc\ssl_wl.txt). In them, you can exclude or alternatively specify IP addresses or domains to which you should or should not use SSL MiTM. If you specify extra ssl port, you do not need to specify the read\write type, just specify the port number. All traffic is written in ssl_log.txt. Note: during the test, I was unable to get the Cookie Killer to work, either in the virtual machine or with a separate real computer. If you only need the certificate, you will find it in the folder of the Intercepter-NG program, the misc\server.crt file.